On the surface, a shot list communicates to your crew what types of shots you intend to get for coverage of a scene. But we all know once you get to set, issues arise and something always has to give. You either have to lose, combine or sometimes even add shots to ensure your editor has the coverage they need by the end of your shoot day. So how can we use a shot list to be better prepared before we get to set? We’ll line the script with our shots to help us decide what different types of camera shots will give us the best coverage and prepare us for the inevitable changes once on set. Taking your shot list and lining the portions of a scene each shot covers begins the process of translating what you see in your head into the tangible medium of film and video. You want potential issues to come to light now to plan for them, especially on an independent production where wearing multiple hats equals an increased chance of missing something. Let’s use a very simple script to demonstrate. 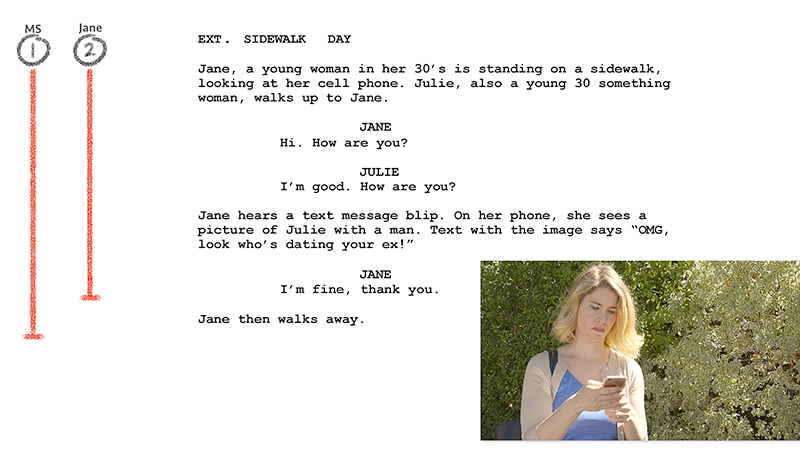 Here we have two women, Jane and Julie, meeting on a sidewalk. Let's line the script with a master 2 shot, shot 1, that covers the whole scene. Now let's add a single of Jane, shot 2. Note that on the script I end it when she’s done talking, which means we don’t get a shot of her leaving her single shot. Let's open up that shot, by lengthening that line, ensuring we know she needs to exit her single, giving our editor choices. Let's add a single of Julie, shot 3, but open up the start of that shot so we’re clear we get her entering the shot. We'll also open up the end, so we have a shot of Jane crossing her frame, with Julie turning her head to follow her. More editorial choices. We need an insert of Jane’s phone, which can be shot almost anytime on set, even with a stand-in’s hands if we have to. This gives our shooting schedule flexibility but in the script, Julie is standing in front Jane for that shot, meaning she may have to be in the background. If we think ahead, we can check that shot first and adjust how Jane holds her phone in her single, so we can get that insert shot without Julie in the background. What if this scene was a hair longer, with Jane turning around after she walks away and yelling at Julie? Let's have a slight tracking shot of Jane walking, shot 5, and a single of Julie turned, looking at Jane, shot 6. You’ll notice our shot lines all start and stop at one point. This indicates a point you’re forcing the editor to cut and limiting their choices. 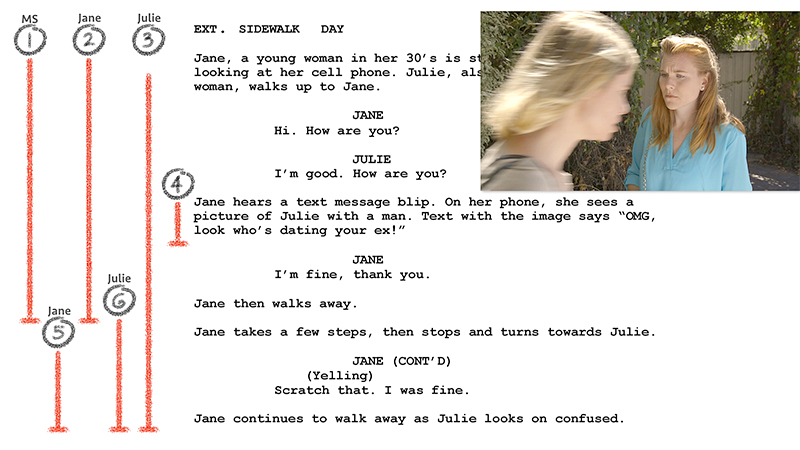 Let's open up the beginning of shot 6, Julie’s single, so we get Jane walking by her and wiping the camera. We could also continue shot 3, Julie’s first single and move the camera into an over the shoulder on Jane. Now let's say you’re on set and for reasons out of your control, you know you don’t have enough time to get all your shots. What can you do? Two choices are to either loose shoots or combine them. The key is to make sure you get the performances you need and leave choices for your editor. We could lose the master shot as we only expect to use it in the opening anyways. Check your lined script to see if that leaves any holes. We can combine Jane’s single, shot 2, with the tracking shot, shot 5. Two shots for the price of one. We’re now down to 3 interesting shots that give us choices and an insert we can shoot anytime. Shooting a scene is never easy but when you prep your shot lists with a lined script, you can set yourself up to win, getting the shots you need during the inevitable chaos of a shoot. You may even give yourself time to shoot some variations.